Editor's Note: This homily was originally published in America Magazine and reprinted here with permission. My first homily as a priest took place on Pentecost. What a gift! As I began preparing it, I felt a lot of fear. Many family members and friends with diverse religious and political views would be present, and I would be preaching to a parish community that I did not know well. I was a brand new priest and afraid of the unknown. My spiritual director has encouraged me to ask God directly, “What do youwant to communicate to the people today?” I had a sense that God wanted to say to each person in the church that they have a gift that the church needs, and also that Jesus wants to come close and touch and heal those parts of ourselves, our society, and our church that are afraid and locked up. So that was the heart of my homily. I received the gift of the Spirit. I felt peaceful and passionate as I delivered it. And the response has been overwhelming. The reference to the Disney film “Moana” resonated with adults and kids alike. People said they felt moved, less afraid, and more hopeful, especially for the church. I learned to rely on the Spirit and be open to the Spirit working through my preaching. I love the Disney film “Moana.” I really love it. It is about fear and freedom, call and courage, hope and redemption—themes that relate to what we celebrate on Pentecost. There is one rule on this Polynesian island: No one can go beyond the reef! The elders say it has always been the rule. The world is too dangerous. Even when things are dying on the island and the livelihood of the community is threatened, the rule still stands. It is a powerful image of a church in fear, locked in the Upper Room. Moana, the teenage daughter of the chief, is filled with a Spirit that calls her to go beyond the reef. She has a vision that allows her to see that her people were once voyagers who sailed the length of the seas. Now that ocean is the Spirit that calls her, leads her, and supports her when she needs a lift or a push. This community was not always locked in the Upper Room. And now this voyaging could bring new life to their island. Moana is priest and prophet and will become chief of her people. We Christians, at heart, are voyagers. We are a pilgrim church sent to proclaim the Good News to every nation. The readings for Pentecost help us to remember it is the Spirit who enables our voyage, and we must renew ourselves in this Spirit. This Spirit gives life and empowers wonders and signs. This Spirit is dangerous. It “blows where it wills.” It cannot be contained by even the best of structures and rules. This Spirit blows open locked doors. This Spirit surprises us, dwells in us and renews us. The Spirit cannot be contained by even the best of structures and rules. How have you experienced and witnessed the power of the Spirit in your life? We have all been in that locked Upper Room. We can be afraid to walk outside when there is risk and cost. To extend forgiveness to someone who hurt us. To cross racial barriers in a segregated city. To bridge cultural differences in a diverse parish. Parts of us are afraid and behind locked doors. Parts of our society are afraid and behind locked doors. Parts of our church are afraid and behind locked doors. But these are not barriers to the Risen Christ. A shut tomb or a shut church cannot keep Jesus out. He says: “Be not afraid. Take courage. I am with you.” These parts of ourselves, our society, our church, Jesus enters to breathe the Spirit, to touch, bless, heal, renew. Parts of us are afraid and behind locked doors. Parts of our church are afraid and behind locked doors. The greatest privilege of my ministry as a deacon was co-teaching a course on forgiveness at a federal women’s prison. We started every class by invoking the Holy Spirit, the one who gives the gift of forgiveness. We explored the fears and locked doors in our lives, when guilt, shame, or deep hurts make it so difficult to ask for forgiveness, to extend forgiveness, or to forgive oneself. The Spirit was alive in this class. One woman spoke about forgiving the two men who murdered her son. Others received the strength to ask for forgiveness for hurting people they love, often because of an addiction. Some could not forgive, often in cases of sexual abuse by family members. I finished the course with this question: Could these women forgive us, for imprisoning them, most of them mothers now separated from their children, all women who were victims in need of healing and justice long before they committed any crime? A shut tomb or a shut church cannot keep Jesus out. At the final class, each woman sat in a chair, named how she is a gift and listened to others affirm her. Of everything we did in the class, it was the most challenging exercise for these women: to recognize the Spirit descending upon them, saying, “You are my beloved daughter, in whom I am well pleased.” The Spirit offers this gift, too, to them, and to each of us. Our beloved church, like those disciples in the Upper Room, still experiences fear and locked doors. The first time Pope Francis was asked about women’s ordination, he responded that John Paul II said no. “That door is closed.” Presumed in the question and answer was the ordination of women as priests. 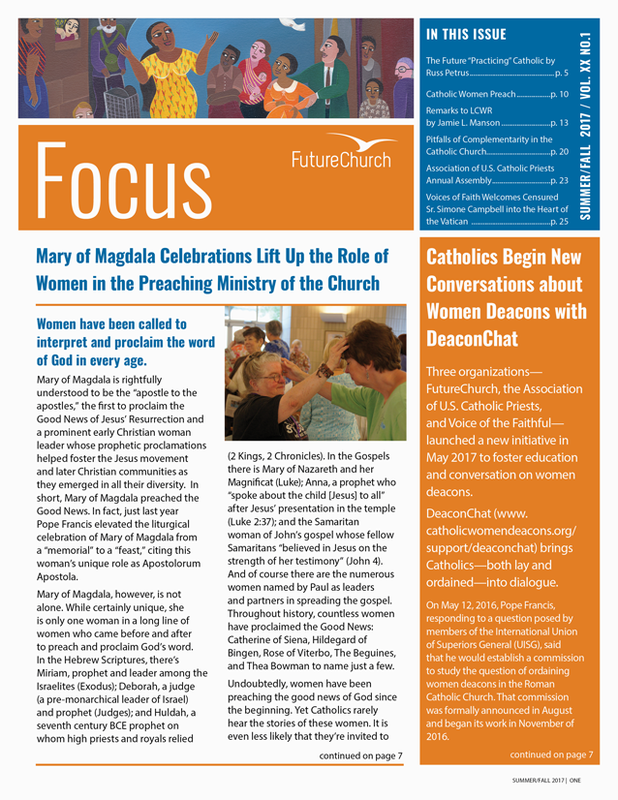 Three years later, at the request of women religious from around the world, Pope Francis agreed to everyone’s great surprise to establish a commission to study the diaconate of women. Deacons, of course, are ordained to serve in the ministries of Word, liturgy, and charity. In the many areas of church life, where are we free—or fearful? In what places do we need greater freedom to be effective ministers of the Gospel? In his letter to the church in Corinth, Paul says, “The manifestation of the Spirit is given to each person for some benefit.” We must take this seriously. In order to fulfill its mission, the church needs the unique gifts the Spirit has given each person. No one is excluded: man or woman or child; black, brown, or white; gay or straight or bi or transgender; clergy or lay; C.E.O. or service worker; Republican or Democrat or neither. What matters is that you are baptized priest, prophet, and king. And the church and the world need your unique gifts. What are your unique gifts of the Spirit for the benefit of the church and the world? In a few moments, we will call upon this Spirit to transform simple gifts of bread and wine. And to transform us. Jesus will come very close, to feed us, to free us. He will unlock doors, and he sends us to do the same.